Renn Brown: Good filmmaking has a way of making even the most mundane conversations epic in one way or another, so it’s no surprise that a central theme of impotence is actually quite easy to miss in Tinker, Tailor, Soldier, Spy. With so many brilliant actors chewing on seasoned dialogue amidst impeccably recreated period settings, the fact is almost lost that these men are so deeply invested in an organization and lifestyle, the importance which is clearly a shadow of what it was in the distant glory days. The deeds and secrecy on display in the film are as much a struggle of ego, personal politics, and legacy protection as they are any prevention of war or guarding of national security. World War III is of course the looming threat, but even amidst those who know the most and whose actions could theoretically have the greatest effects that danger seems far off compared to the grudges and scars of insecurity between these men. All that said, Thomas Alfredson has crafted a sharply intelligent thriller that will please any fan of mysteries with a calculated pace and subtle performances. Gary Oldman restrains every tick and twitch to craft a performance that feels distinctly British- a bit stuffy, but covering up an internal storm of conflicting pride in tradition and insecurity at facing a growing world. He’s surrounded by a veritable legion of British actors of every generation, each bringing his A-game. So, essentially, if you can get down with a bunch of stodgy white people talking about matters of esoteric importance, this is a movie for you. Nick Nunziata: I love white people, so this is the movie for me! All kidding aside, this is an amazingly dense movie. And it takes a while to fall into rhythm with it. Once it does have its hooks in it gets so much mileage from so many places with its aristocratic betrayals and quiet menace and performances entirely built around subtlety. There are maybe five gunshots in the whole movie, which is atypical in the genre. There are extremely few confrontations. There’s no real action sequences at all, and with that all said it’s as exciting in its own way as any summer movie. Why? Tone, tone, tone. Let the Right One In could have been a fluke, but Alfredson showcases here a firm grip on the material and coaxes performances from oft-seen talents like Gary Oldman, Mark Strong, and Colin Firth that don’t seem familiar. It’d had been extremely easy to have these performers revisit performances and wear them like old suits, but the Gary Oldman of Tinker is a much different beast and considering how big he’s able to get with a performance this grace and complexity is extremely welcome. Renn Brown: Alfredson also gets a lot of mileage by having many of these actors subtly play against type. There’s nothing actually unprecedented going on, but it’s interesting seeing Oldman play reserved while Colin Firth goes a bit slimy, Toby Jones goes cocky, and Tom Hardy plays the vulnerable lover boy (with lots of hair). Then you have John Hurt in his comfort zone, Cumberbatch impressing in unexpected ways, Cirián Hinds being reliably downtrodden, and Stephen Graham (who is having a great year) showing up for a brief but excellent scene. The cast is nearly as dense as the spycraft in this John le Carré adaptation about an aging spy who is secretly called back to investigate the agency from which he was forcibly outed, after a disastrous mission shifted the balance of power within “the circus” and potentially left a Russian mole in a very high position of power. 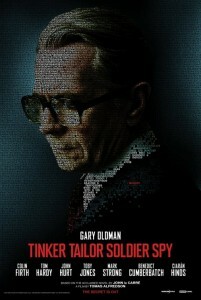 George Smiley (Oldman), a quiet man boiling with pain from his wife’s infidelities and his own premature retirement, is asked to look into the matter which sparks off a mission of quiet intensity in which the theft of record books and conversations about memorandums provide pins-and-needles entertainment. Le Carré’s London of the early 70s is exactingly recreated so Alfredson and his cast an spin this story of espionage, which vaguely parallels real events from the 1950s-70s. Nick Nunziata: The film is stunning to look at, with its elegantly recreated past, muted Earth tones, and spot on costuming and hair. In the same way that The King’s Speech boasted a very welcome and effective recreation of old England so too does this albeit a much more recent version. There’s so much extra value here and with the assemblage of talent on display it’s a rare film that will appeal to the Merchant/Ivory crowd as well as the Jason Bourne crowd. There are certain films that grab audiences and drag them into more cerebral turf without them having to put up a fight. All the President’s Men. 12 Angry Men. The Insider. Tinker, Tailor, Soldier, Spy accomplishes that feat and with grace and subtly beats the high profile flicks at their own game. As he proved with his vampire flick Alfredson knows how to achieve a payoff through subversive methods. There are scenes here that are as intense as any action scene this year, including one that simply revolves around a man trying to get a document from the library. It’s energizing to see films still being made this way in 2011. Oh and there’s an incredible moment of owl abuse. So that helps. Nick Nunziata: It does to me. This is rich stuff, the kind “they don’t make anymore”. It’s a film I can’t wait to have at home so I can enjoy every complexity and soak in every subtlety. From the performances (Oldman, Strong, and most surprisingly Benedict Cumberbatch) to the production design to the very assured and deft direction, it is a must see and a prime cut of entertainment. If this movie were released in the 1970’s it’d be one we see referenced among the best of the genre but it stands out even more so now, a perfect example of the kind of movies vital to the cinema diet of anyone who feels that explosions and synapse taxing editing is how you craft a worthy thriller. Renn Brown: Tinker, Tailer, Soldier, Spy is confidently built from master-class filmmaking, and the rare successful amalgam of affecting drama and adult thriller. Effortlessly stylish and driven by a stronger pulse than its reserved veneer would immediately suggest, Alfredson’s second film is another knockout for the director and an indication that he’s going to quickly stake a claim as one of our greatest living masters of cinematic tone, and a true actor’s director. That a potential franchise lays in wait for this character is an exciting possibility, as it’s rare that a universe and set of characters engineered with such sophistication and explored on an adult level is revisited by an empowered director. Whether we see more from George Smiley or not though, Tinker, Tailor, Soldier, Spy is a remarkable film and a huge achievement for Alfredson all its own.